PROF. JACOB L. WRIGHT: Yael and the Subversion of Male Leaders in Judges (TheTorah.com). Could be. Redaction criticism is fun too. DECODED? FAMOUSLY INDECIPHERABLE ANCIENT MANUSCRIPT THAT BAFFLED EVEN NAZI ENIGMA CODE BREAKERS TRANSLATED BY AI (Kastalia Medrano, Newsweek). The Voynich manuscript is famous for being indecipherable. The 240-page text is written in an unknown language, in an unknown script, scrambled by an unknown code, as CTVNews put it. It's a puzzle with no way in. Even the Bletchley Park cryptographers, renowned for cracking the Enigma code used by the Nazis during World War II, couldn't make any headway. Now, Greg Kondrak, a computer scientist in the AI lab at the University of Alberta—the same one behind the DeepStack system that made waves last year by beating professional poker players—claims he's begun to crack it open. Step number one, Kondrak told CTVNews, was figuring out what the language is. The statistical algorithms he and his co-author designed proved about 97-percent accurate when translating the United Nations Universal Declaration of Human Rights (into 380 languages). The same process, applied to the Voynich manuscript, suggested the language was Hebrew. As for the code, they believe that it involves the letters in each individual word being shuffled, and their vowels dropped. According to their algorithms, the manuscript's first complete sentence reads, "She made recommendations to the priest, man of the house and me and people." They also believe the text includes the words "farmer," "light," "air" and "fire," according to CTVNews. The speculation is that the text deals with "women's health," partly, I guess, from the supposedly decoded text, and partly because of the many illustrations of naked women bathing. We'll see. I am skeptical, but let's keep an eye on the story. READING ACTS BLOG: Book Review: John Barclay, Pauline Churches and Diaspora Jews (Phil Long). FORTHCOMING BOOK FROM ZONDERVAN: Basics of Greek Accents Eight Lessons with Exercises Author: John A. L. Lee. Out in April of 2018. We are delighted to announce the appointment of Dr Michael Lyons to a new lectureship in Old Testament / Hebrew Bible, starting September 2018. Dr Lyons completed his PhD at University of Wisconsin-Madison, and has held a position at Simpson University for the last ten years. His areas of research include the investigation of compositional strategies in the prophetic corpus of the Hebrew Bible and the dynamics of text-referencing in ancient Israel, Second Temple Judaism, and early Christianity. He is the author of several volumes on the book of Ezekiel, and has published in Catholic Biblical Quarterly, Ephemerides Theologicae Lovanienses, and Journal of Northwest Semitic Languages. He'll be working alongside Prof. Jim Davila, Dr Bill Tooman, and Dr Madhavi Nevader in our Old Testament / Hebrew Bible section. And yes, we are truly delighted to have Michael joining us in September. FROM THE DESK OF KURT MANWARING: 10 questions with Gabriele Boccaccini. This interview is illuminating and informative, not only about the Enoch Seminar and the current state of Second Temple Jewish studies and related fields, but also about Professor Boccaccini himself. TRAVEL: TUNISIA HOLIDAYS: WHY TOURISTS SHOULD LOOK BEYOND THE BEACH AND DISCOVER ITS ANCIENT ROMAN HERITAGE. After terrorist attacks scared away the sun lounger crowd, visitors to Tunisia are now rediscovering its rich Roman history (NICK REDMAYNE, The Independent). We’re in Carthage, Tunisia’s best known and most visited Roman site. Perched on the Mediterranean coastline, a visit is worth it for the spellbinding views alone, but in truth, the development of the modern city, combined with centuries of neglect, hasn’t left Dido’s ancient citadel in its best possible state. Instead, [tourguide] Chaouki [Latrache] wants to show me some of the country’s lesser known ruins, all within a couple of hours of Tunis, meaning you can comfortably manage them in day trips from the capital. We start with Dougga, a Unesco-designated site in the north-west of the country, and find we have the place almost to ourselves. Chaouki reckons it’s seven years since he last brought an English tourist here. Cross file under Punic Watch. Some past posts on Phoenician and Punic antiquities in Tunisia, and the current dangers there, are here and here and links. I don't think I'll take my holiday there this summer either, but maybe someday. TRAVEL: Syria Publicizing Aleppo, Palmyra at Fitur Fair (Financial Tribune). The Syrian government is making efforts to promote the country as a tourist destination following a civil war that has devastated much of its area. This week the Syrian government is publicizing Aleppo, along with other destinations in Syria, at the Fitur International Tourism Trade Fair in Madrid, AFP reported. It is the first time Syria has attended the trade fair since 2011, before the war broke out. Along with the ruins of Aleppo, it also encourages people to visit the ancient Roman-era ruins of Palmyra, the UNESCO-listed archeological site that was twice controlled by the self-styled Islamic State terrorist group. [Bassam Barsik, director of marketing at the Syrian Ministry of Tourism] argued that religious destinations, such as the historical Christian town of Maaloula, one of the last places on earth where Aramaic is still spoken, are still a draw to tourists. I don't think Syria will be my holiday destination this summer. Maybe someday. This promotion seems a bit premature, but things must be quieter if the Syrian government thinks it can even raise the subject. I hope this augurs some better things for the people of Syria. For many other past posts on the site of Palmyra, its Aramaic language, its artifacts, and its tragic fate while in the hands of ISIS, start here and follow the links. And for past posts on Maaloula (Ma'aloula, Malula), which also suffered much during the war, start here and follow the links. GOOD NEWS: Dead Sea Scrolls language researcher named as winner of Israel Prize. Education Minister Bennett approves Elisha Qimron to receive prestigious award for his work on the ancient documents (Stuart Winer, Times of Israel). Congratulations to Professor Qimron on this well-deserved honor, to be awarded on the seventieth anniversary of the modern State of Israel. Review of Männkein-Robert (ed. ), Die Christen als Bedrohung? BYRN MAYR CLASSICAL REVIEW: Irmgard Männkein-Robert (ed. ), Die Christen als Bedrohung? Text, Kontext und Wirkung von Porphyrios’ 'Contra Christianos'. Roma Aeterna 5. Stuttgart: Franz Steiner Verlag, 2017. Pp. 348. ISBN 9783515115377. €56.00 (hb). Reviewed by Pieter W. van der Horst (pwvdh@xs4all.nl). This volume contains 14 papers that were presented in 2014 at a conference in Tübingen on a variety of problems concerning Porphyry’s Kata Christianôn and its cultural context. The conference took place in the larger framework of the Sonderforschungsbereich 923, called ‘Bedrohte Ordnungen’ (hence the title of the book). In a short Introduction, the editor presents a concise overview of the recent spate of scholarly work on Porphyry’s polemical treatise 1 and outlines the contributions in the volume. In the compass of this short review it is impossible to discuss all contributions in detail and do justice to them. Hence I will briefly indicate their contents and conclude with some general remarks. Porphyry is of interest for PaleoJudaica because he was reportedly the first to dispute (correctly) the sixth-century authorship of the Book of Daniel. But the chapter by Aaron P. Johnson in the book under review may raise doubt that the passage actually comes from Porphyry. Porphyry also interacted with Christian Gnostics and refers to some Gnostic Old Testament Pseudepigrapha. For past PaleoJudaica posts on Porphyry, see this notice of a review of Matthias Becker's recent edition of Contra Christianos and the links there. Becker is one of the contributors to the book under review. The Museum of the Bible as Mediator of Judaism (Jill Hicks-Keeton). "While making pretenses to neutrality, the Museum of the Bible is fundamentally a political project attempting to define what the Bible is and who owns it." For past PaleoJudaica posts on the Museum of the Bible and related matters, start here and follow the many links. TEMPLE MOUNT WATCH: Trumpeting on the Temple Mount. How a Hebrew inscription blasts the Temple Mount deniers (Leen Ritmeyer). PaleoJudaica has mentioned the "place of trumpeting" inscription here. For more on the Temple Mount deniers, see here and links. They are not the same as the Jewish Temple deniers. THAT'S TONIGHT! WISH I COULD GO. University of Chester to show for the first time rare biblical mosaics uncovered in Israel. The panels will be exhibited at a lecture on January 24 (Leah Jones, Chester Chronicle). Images of stunning mosaic panels, uncovered during excavations in Lower Galilee in Israel, are to be shared for the first time in the UK during a lecture at the University of Chester. The panels are part of the Huqoq Excavation Project - an astonishingly rare and hugely significant discovery of a late Roman/Byzantine synagogue, which has attracted widespread international media attention. Archaeologist Dr Dennis Mizzi, from the University of Malta, will be unveiling photos of the panels, which depict an array of biblical scenes. For more on the Huqoq excavation and the mosaics found there, start here and follow the links. And while we're at it, for some images of the Roman ruins in Chester, see here. ROGUE CLASSICISM: Purported Parthenon Pediment Image from ‘Bethsaida’: Followup. David Meadows has more information, but is still skeptical. Unfortunately, there still is no solid reason to connect this with the Parthenon. Background on the potsherd discovered at E-Tell is here. THE DEBATE GOES ON: Iraqi-Jewish archive triggers 'traumatic memories' (Dalia Hatuqa, Al Jazeera). The article has its own slant, as article on the subject usually do, but it also provides a useful update on where negotiations on the fate of the archive stand at present. I have presented some of my own thoughts on the subject at the links here. Background here and many, many links. ASKING THE IMPORTANT QUESTIONS: Canon as an Authoritative List of Books or a List of Authoritative Books? (John Meade, ETC Blog). The distinction does matter. ARCHAEOLOGY: Could This Newfound Cave Hold More Dead Sea Scrolls? (Owen Jarus, Live Science). Archaeologists are excavating a newfound cave in Qumran, with the hope of finding new Dead Sea Scrolls. Hebrew University archaeologist Oren] Gutfeld and Randall Price, of Liberty University in Lynchburg, Virginia, are now leading an archaeology team that is excavating this newfound cave. "Dr. Gutfeld and I have been at Qumran since December, working with our team on excavating a new cave in the Qumran area," Price told Live Science in an email. No other details about this "new cave" have been released, but the team will release a statement soon, Price said. Presumably there was something about this cave that led the excavators to think it was likely to have more scrolls in it. I look forward to more details. Background on the so-called Qumran Cave 12, which only produced a piece of blank parchment, is here. THIS WEEK'S DAF YOMI COLUMN BY ADAM KIRSCH IN TABLET: The Talmud’s Revenge Fantasies. In this week’s ‘Daf Yomi,’ the oft-banned tractate that indulges a God ‘making sport’ with the enemies of a persecuted and oppressed people. This week, Daf Yomi readers began Tractate Avodah Zarah, the section of the Talmud devoted to the laws forbidding idolatry. As we already learned in Tractate Sanhedrin, avodah zarah—literally, “strange worship”—is one of the most serious sins in Jewish law. Not only are Jews who worship other gods liable to be stoned to death, but Jews must avoid even mentioning the names of those gods, in accordance with Exodus 23:13: “Make no mention of the name of other gods, nor let it be heard out of your mouth.” In the Roman Empire, where images of gods were omnipresent and pagan festivals governed the calendar, this would have presented a constant challenge. How did Jews, Christians, and others in the ancient Mediterranean world understand each other? What did they think about the possibilities of communication across the different languages and cultures around them? What made something true, believable—or suspect? The Jewish Studies Program and the Department of Religious Studies at UC Davis are proud to host an international conference on concepts of religious language, particularly issues of credibility, propaganda, and translation between languages and cultures in the ancient world, with a focus on Jewish and Christian texts of the Hellenistic and Roman eras. Local faculty, graduate students, and invited guests will spend three days discussing the possibilities of communication and credibility—issues that seem particularly salient in today’s political climate, but were no less vital in the ancient world. MOSAIC MAGAZINE has now published two responses to its earlier review of the Museum of the Bible by Diane Muir Appelbaum, which I linked to here. Biblical Illiteracy = Cultural Illiteracy. The Bible molded modern English and shaped American society and culture. Now, as attacks on the Museum of the Bible suggest, it has been cripplingly tossed aside (Edward Rothstein). The Bible Has Long Deserved a Museum. Now it Finally Has One. Anyone expecting to find a politicized museum dedicated to hot-button “culture-war” issues needs to look elsewhere than the new Museum of the Bible (Peter Wehner). For past posts on the Museum of the Bible and related matters, start here and follow the many links. THE ORION CENTER FOR THE STUDY OF THE DEAD SEA SCROLLS AND ASSOCIATED LITERATURE in Jerusalem has published Orion Newsletter 23 (2017). When you click on the link the current newsletter comes up as a pdf file ready to download. You can also download earlier newsletters from the same link. The last one I noted on PaleoJudaica was the one for 2015. The 2016 newsletter is here. RECONSTRUCTED AND DECODED: UNIVERSITY OF HAIFA RESEARCHERS DECIPHER MYSTERIOUS DEAD SEA SCROLL. “An important peculiarity of the present discovery is the fact that the [Qumran] sect followed a 364-day calendar" (Daniel K. Eisenbud, Jerusalem Post). They [the Qumran sect] wrote numerous scrolls, a small number of them in code – including the 60 relics on parchment that Dr. Eshbal Ratson and Prof. Jonathan Ben-Dov of Haifa University’s Department of Bible Studies were able to translate. The researchers spent a year painstakingly studying the tiny fragments from the second-to-last scroll, some which measured smaller than one square centimeter. “The reward for their hard work is fresh insight into the unique 364-day calendar used by the members of the Judean Desert sect, including the discovery for the first time of the name given by the sect to the special days marking the transitions between the four seasons,” the university said in a statement on Sunday. 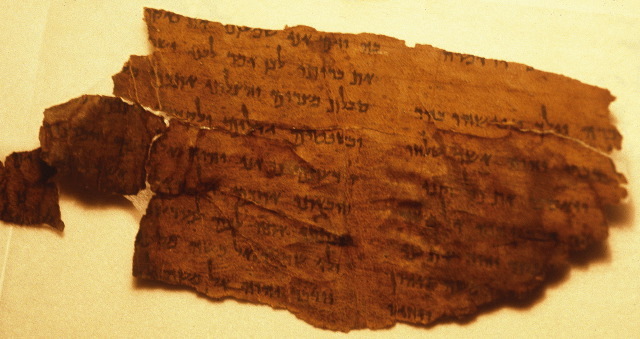 Although an earlier researcher who examined the 60 pieces postulated that they came from several different scrolls, Ratson and Ben-Dov proved in an article recently published in the Journal of Biblical Literature that the fragments actually constitute a single scroll. The JBL article is available on JSTOR, but only to subscribers. The abstract is at the link. UPDATE: The JBL article is available at Academia.edu here. HT Joseph I. Lauer. CONSERVATION CONTROVERSY CONTINUED: EXCLUSIVE: The archaeological report Israel wants to bury. A survey obtained by i24NEWS warns Lifta, a unique heritage site, could be destroyed (Maya Margit). If Israel wants to bury the report, they haven't done too well so far. Haaretz got hold of a copy more than a year ago and publicized it then. I noted that story here. A key issue is that the site turned out to have been inhabited earlier than anyone thought – as early as the Hellenistic period. Still the i24 article is longer and a bit more detailed. But the most important thing we learn from it is that the matter is not yet resolved. The ILA's development plan for the village is still active, but it appears none of it has been implemented. Watch this space. LARRY HURTADO: “The Fate of Rome”: Kyle Harper’s New Book. PUNIC WATCH: What Can An Ancient General Teach Us About Modern Leadership? Patrick N. Hunt discusses his new book on Hannibal and how much of his success was based on solid financing. (Knowledge@Wharton, ValueWalk). For more on Dr. Hunt's new book and his research, see here and links. REVIEWS OF BIBLICAL AND EARLY CHRISTIAN STUDIES: Perceiving the Other. As Johnathan Z. Smith notes, “While the ‘other’ may be perceived as being LIKE-US or NOT-LIKE-US, he is in fact most problematic when he is TOO-MUCH-LIKE-US, or when he claims to BE-US”. The task of the present volume—which grew out of a colloquium at Ben-Gurion University of the Negev—is to explore this “problematic” space in the literary production of ancient Judaism and early Christianity.